Denyse and I have been visiting the Daintree area in Far North Queensland since we met in 1973, and she was coming here on holiday since she was a little girl. It's one of our favourite places in all of Australia. Usually, we come in the shoulder season (in late September or October), but this year we visited in late August, when there were still lots of visitors. We were pleased to find there was a site available for us at Pinnacle Village Holiday Park. The trip from Cairns to Port Douglas and on to the Daintree and Cape Tribulation area is one of the most spectacular drives we know. It takes you past oceanfront and through rainforested mountains, along with flats richly carpeted with sugar cane. The total drive is about 140km. Make sure you get a map of the area before you leave. They are available free on the vehicle ferry, as well as at various shops and tourist centres. Past Port Douglas you pass through the township of Mossman, the nearest service centre, where you’ll find a large, new Woolworths supermarket. Keep going for another nine kilometres and you reach Pinnacle Village Holiday Park. From there it is only about a 10-minute drive to the Daintree River car ferry, followed by a magnificent drive on the sealed, double-lane road to Cape Tribulation through World Heritage-listed rainforest. The 4WD dirt section takes over at Cape Tribulation and carries on to the Lions Den Hotel. A bit further on and you’re in Cooktown. From the vehicle ferry to Cape Tribulation it’s about 45km. If you continue on the road north, rather than crossing the Daintree River, after a further 10km-or-so you will come to the quaint village of Daintree. On the way you will pass several croc-spotting and nature tours. Daintree village is small, but it does have several eateries, a great woodworking/souvenir shop, a couple of other souvenir shops and a tour booking office. Continue to the small jetty from which one of the croc-spotting tours leaves. There used to be, and maybe still is, a large croc that suns himself on the mud bank just across from this jetty. Prepare for a treat while crossing the Daintree on the vehicle ferry, as this is where the rainforest really does meet ocean and the Reef. This tropical lowland is the world’s most ancient rainforest, perhaps 200 million years old. Difficult as that idea is to grasp, dinosaurs ruled and roamed this very forest. When Denyse and I first started coming here, the road from the highway to the ferry, and on to Cape Tribulation, was single-lane dirt, much of it corrugated and jarringly pot-holed. Roadside trees were smothered with dust kicked up by passing traffic, while muddy runoff in the heavy tropical rains was a serious threat to the Reef’s nearby sections. This all changed for the better once the road was sealed. About six kilometres from the ferry, your first stop might well be the lookout at the top of Alexandra Range. 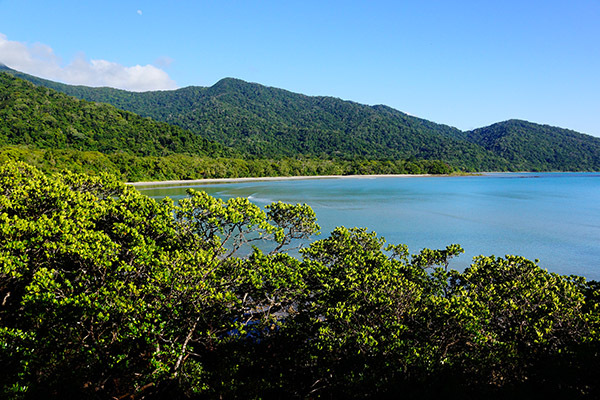 This panoramic view includes the mouth of the Daintree River, Snapper Island and Low Isle. We left this until the way back, as the morning sun was in our faces and the afternoon is better for taking photographs, plus access is easier from the road’s eastern side. Aboard the ferry at 7.30am, we drove straight to Cape Tribulation and arrived there before the tour buses. On this occasion we made our first stop at the Daintree Discovery Centre, located a couple of kilometres on from the lookout. The privately funded centre was set up to give visitors an idea of what this World Heritage area is all about, as there is no educational centre within the national park itself. The professional staff, brimming with expertise and local knowledge, provides a solid introduction to rainforest ecology. The entry fee guarantees access for seven days, so visitors can return to ask questions or have their snapshots of birds, animals and plants reliably identified. The centre also boasts a good cafe and souvenir shop. There are several inter-connected walks, including a tree-top safari, followed by a climb to the top of a 23-metre tower from which the rainforest’s canopy and craggy mountains can be appreciated. Denyse and I had no trouble climbing the tower, as there are rest stops at each landing, with each featuring a storyboard describing the birds and animals you may well see in the forest’s different storeys. Gazing down from our high perch we were delighted to spot a cassowary going about its business on the forest floor. Another section is dedicated to dinosaurs and long-vanished mega-fauna, with life-like moving replicas. There are also sections devoted to reptiles and bush tucker. Take the walk and you will be given information books and an audio speaker to take with you, both providing information on points of interest that are numbered for easy reference and which include backgrounders on local Aboriginal history and traditions. There is a mountain stream running through the area, and you will often spot a cassowary among the foliage. The walk is a great introduction to what you will see in the greater Daintree rainforest, and we found its information and explanations of the interactions between animals, plants and Aboriginal heritage entirely fascinating. Our only regret is that we did not call in years ago. You can always learn something new about this spectacular area! You will cross several crystal clear mountain streams, all great for photos, before arriving at Cape Tribulation, which was named by Captain Cook after he ran aground near there. Visit the lookout before enjoying a walk along the beach. If the tide is low, you can see the reef emerge at the beach’s northern end. After our walks and before heading back, we always enjoy a cuppa in the picnic area, a lovely spot to admire the spectacular red beech trees and strangler figs. There are several other spots to grab a bite before the next stop, at the Marrdja botanical walk on the left. This takes you into the rainforest and onto a boardwalk winding through huge mangroves. It’s a Tolkien-esque environment, with an abundance of epiphytes clinging to the giants’ trunks. Look up near the fork in the track to see various types of orchids in the trees. This is one walk you really should not miss. Better yet, it's an easy expedition, with no climbing. You might also want to stop and explore several beaches on the way back, as the road follows the coast. There are a number of places to stop for a cuppa or lunch, as well as take on fuel. Take your time, as you will want to make the most of the $26 return (per vehicle) ferry fare. You might, for example, enjoy a stop at the Nerada tea plantation, the exotic tropical fruit ice-cream shop, or the pub. Our favourite spot has always been Cape Tribulation beach.